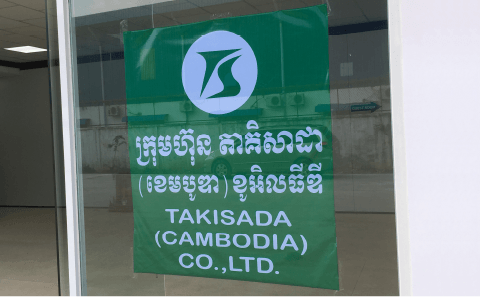 TAKISADA(CAMBODIA) : Takisada-Nagoya Co., Ltd. This TAKISADA-NAGOYA-owned factory manufactures dress items mainly consisting of menswear suits, jackets, and pants. Although the products are mostly exported to Japan, we are seeking to expand sales to other countries with the goal of the factory becoming independent. Located near to the border between Cambodia and Vietnam, TAKISADA(CAMBODIA) is able to import and export via Vietnam to reduce the shipping time. The company strives to provide total satisfaction to our customers by utilizing human resources, equipment, and environment to provide quality, on-time delivery, and prices.